Many of us have old, used jewelry just lying around the house that we simply don't know what to do with. It's nice to change jewelry every now and again, and not have to wear the same piece of used jewelry everywhere you go. Here at Casino Pawn and Gold in Casa Grande, we're one of the largest jewelry stores in the area. We're happy to buy your old used jewelry, or even sell you some good quality used jewelry. We pride ourselves on being a fair, honest jewelry store. With years of experience as a jewelry store in many cities of Arizona, including Coolidge, Eloy, Maricopa, and Florence, we've become experts at identifying good quality jewelry, and are here to either buy jewelry or sell jewelry. 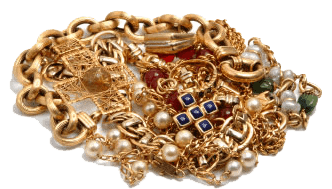 We'll even trade-in your old, used jewelry for newer, good quality jewelry. Whether it's gold, silver, platinum, or diamond, we're more than happy to make you an offer for a pawn or give you cash for your jewelry. Not even a jewelry store could offer the prices that Casino Pawn and Gold has to offer you for your jewelry. We are the top jewelry seller, and the top jewelry buyer in all of Casa Grande, and are here to help. Don't believe us? Just take a look at your eBay store! You can take a look at exactly what it is we have to offer at our store, and come see it in person. Or to just get an idea of the true, top quality used jewelry we have within our store. We strive on quality, and will give you the most money for your used jewelry, gold, diamonds, or platinum. What're you waiting for? That jewelry is just collecting dust sitting in your box. You know you don't wear it anymore, so come and sell your used jewelry to us today! Here at Casino Pawn and Gold, we'll never turn down a customer who has quality jewelry. We're more than just a pawn shop, we're a true, full-service jewelry store and are here to give you money for your jewelry.